Dutch painter. He was the son of the Frisian painter and Mennonite minister Lambert Jacobsz. . He received his training in Amsterdam from Jacob Backer c. 1642-6, after which he took up residence in Leiden. He married there in 1648. 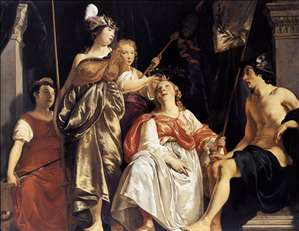 The influence of Backer is evident in several of his early biblical and allegorical paintings, for instance in three allegories, including the Maiden of Leiden Crowned by Minerva, which he painted in 1650-51 for the Lakenhal (the Cloth Hall) in Leiden (all Leiden, Stedelijk Museum Lakenhal). 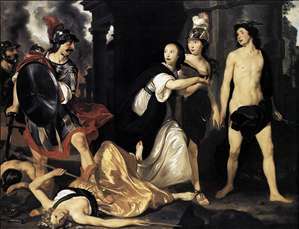 He later turned primarily to portrait painting, of which there are several dozen surviving works dating from 1660, when he moved to Amsterdam, until his death. Good examples are the pendant portraits of the Leiden cloth-manufacturer Pieter de la Court and his second wife Catharina van der Voort (1667; Amsterdam, Rijksmuseum). Van den Tempel also painted group portraits, such as that of Albertina Agnes van Nassau-Dietz and her Children (1668; Leeuwarden, Fries Museum) and the portrait of the Amsterdam merchant David Leeuw with his Wife and Children (1671; Amsterdam, Rijksmuseum). These handsome portraits show some influence of Bartholomeus van der Helst but nevertheless reflect his own slightly more sober style. 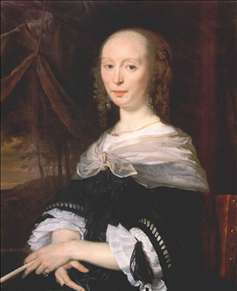 His paintings are among the best Dutch portraits of the third quarter of the 17th century. His work is characterized by the combination of static poses and elegant execution of details, particularly in the rendering of textiles. Among his pupils were Frans van Mieris and Michiel van Musscher. 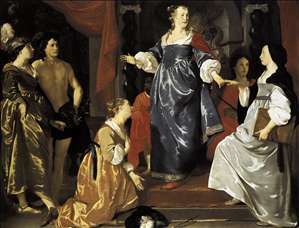 See more details about "Mars Banishes 'Nering'"
See more details about "The Maid of Leiden Welcomes 'Nering'"
See more details about "Minerva Crowns the Maid of Leiden"
See more details about "Portrait of a Lady"